SigFit interfaces to the industry leaders in optical analysis software allowing users to leverage their choice in software. 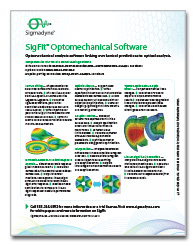 SigFit interfaces to optical analysis software by reading surface prescription data from optical analysis model files and writing macro files readable by optical analysis software. The macro files written by SigFit will modify nominal optical analysis models to incorporate the effects of mechanical disturbances. These disturbances may be surface motions and shape changes, integrated OPD, or refractive index profiles.